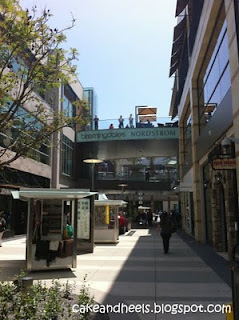 I had a few seconds to finally check out the new Santa Monica Place Mall that opened last Friday. While I didn't get a chance to enjoy any of the new restaurant offerings (Which I plan on doing with my first Summer Friday!) I did get to walk around a bit. Having grown up in LA, the old Santa Monica Place was a staple in the pre-driving hang out locales. I knew that sad mall well, so it was an extremely weird feeling to be walking the exact same infrastructure as the old space, in a totally re-designed al fresco concept. 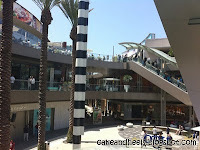 The escalators were all in the same locations, the walkways and bridges the same... I can even picture the center courtyard, with the ghetto food court in the same spot. Gone are the standard mall fare junk stores, and in come the swanky high end retail that have taken over the likes of Beverly Center and Century City. They have certainly made themselves a destination mall. Also, by introducing an "adult friendly" Dining Deck, tricked out with tons of bars & hot bartenders to woo the over sunned and cash expendable clientele, it's sure to be a new nightlife hot spot.